Join Milk Matters is doing something amazing this December and save the lives of babies who desperately need breastmilk to survive. Imagine for a moment, as you sit down to enjoy a Christmas feast with your family, that there is a tiny premature baby in a NICU not far away, who needs just 50ml of donated breast milk to get through the day. Without this life-saving liquid gold, she will not live to enjoy a healthy Christmas with her family next year. Have you donated breast milk before? What are some of your experiences? Let us know by emailing us at chatback@Parent24.com and we could publish your comments. Do let us know if you'd like to remain anonymous. 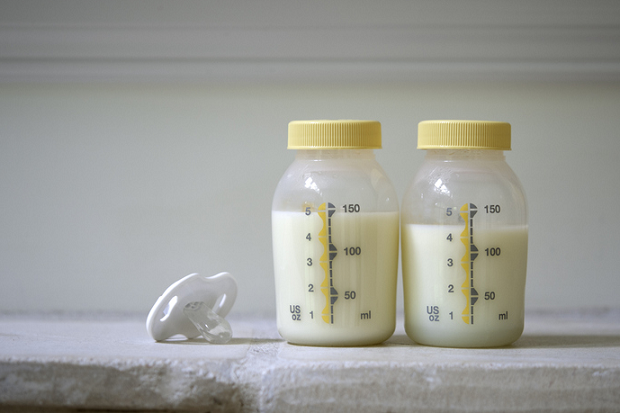 As little as 10ml of donor breast milk at a time is enough to keep the smallest babies going until they are strong enough to digest formula milk, or their mothers are well enough to successfully breastfeed them. As the holidays kick into gear, donations of life-saving breastmilk drop, leaving too many premature babies at risk. 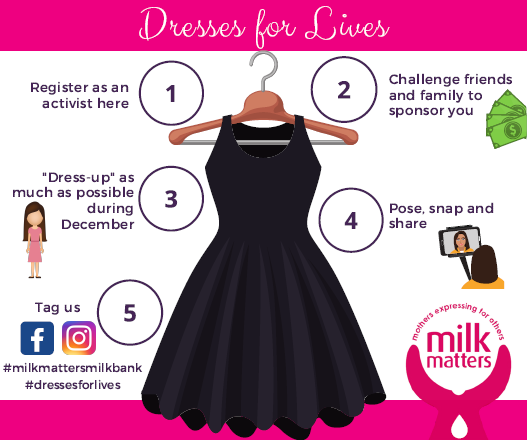 To keep awareness up and donations flowing in, Milk Matters – a Cape Town-based milk bank – runs an annual fundraising campaign called Dresses for Lives. Every December since 2013 Milk Matters has invited participants to commit to wearing only dresses for the whole month. Olivia Fox came up with the idea and did it alone in 2013: it was such a success that in the following year Jenny Wright, CEO of Milk Matters, took on the challenge. It is now an annual awareness and fundraising event. Previous participants have included not only breastfeeding mothers, but also people from all walks of life, from celebrities like Sue Duminy, wife of cricketer JP Duminy, to bikers, athletes and even the babies themselves. “One of our Breastfeeding Peer Counsellors, Carene, who is a dietitian, completed the Nine Peak Challenge and summited each day in a dress! For six days she wore dresses while hiking, sometimes late into the night, before jumping in the car to dash off to the next province and the next mountain!” Jenny told us. “For the babies. There are so many premature babies who need donor milk, but we do not have enough to feed all the babies who need it, nor for as long as they really need it for,” Jenny says. “To be able to feed more babies and therefore save more lives, we need more donor milk. There are still moms who have not heard about donating milk, or don’t know what a difference a little amount will make, and how easy it is to donate” she adds. Also see: Is it good, or safe, to be breastfeeding with just one breast? “I recently got the chance to meet the tiniest, dearest little boy. He was breathtakingly small, but just so perfect. He slept peacefully, totally unaware of the lump in my throat and the goose bumps I had when I heard from his neonatologist that he was only alive because he got 7 days of donor breastmilk from Milk Matters” says Jenny. Breastfeeding at work should be normal!